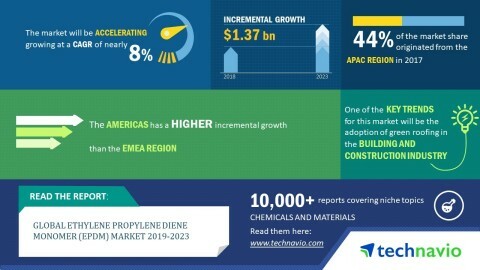 LONDON--(BUSINESS WIRE)--The global ethylene propylene diene monomer (EPDM) market research report by Technavio predicts the market to post a CAGR of approximately 8% during the period 2019-2023. A key driver for the global ethylene propylene diene monomer market is the increasing demand for synthetic rubber. Synthetic rubber has several advantages over natural rubber. They include durability, high abrasion resistance, enhanced heat resistance, and ease of production. Furthermore, the price of natural rubber is highly volatile, which is one of the major factors that has resulted in consumers shifting to synthetic rubber. As per Technavio, the adoption of green roofing in the building and construction industry will have a positive impact on the market and contribute to its growth significantly over the forecast period. This global ethylene propylene diene monomer market 2019-2023 research report also analyzes other important trends and market drivers that will affect market growth over 2019-2023. Green roofs or eco-roofs are a major trend in the building and construction industry, particularly in developed countries such as the UK, the US, Canada, and Scotland. Green roofs are partially or completely covered with vegetation. The vegetation is planted over a waterproofing membrane. EPDM rubber is used as a waterproof membrane owing to its waterproofing properties and resilience. “There is an increase in green roofing because of the growing awareness about the environmental benefits it provides. Green roofing offers thermal reduction and energy conservation, water management, ecological benefits, and carbon sequestration. For instance, in the UK, during 2015-2017, the green roofing market has been witnessing over 17% each year,” says a senior research analyst at Technavio. This ethylene propylene diene monomer market analysis report segments the market by end-user (automotive, molded goods, building and construction, lubricant additives, plastic modification, and other end-users) and geography (the Americas, APAC, and EMEA). The automotive segment held the largest ethylene propylene diene monomer market share in 2018, accounting for over 41% of the market. This end-user segment is expected to dominate the global market throughout the forecast period. The APAC region led the market in 2018, followed by EMEA and the Americas respectively. The APAC region is expected to dominate the market throughout the period 2019-2023. The global ethylene propylene diene monomer (EPDM) market research report by Technavio projects the market CAGR at nearly 8% during 2019-2023.